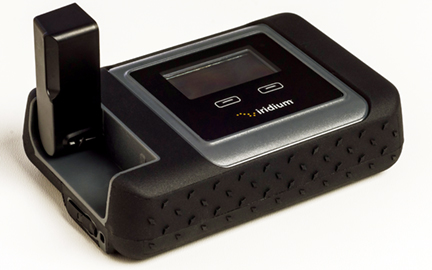 [SatNews] Iridium Communications Inc. (Nasdaq: IRDM) has debuted their Iridium GO! (tm) and two additional products to the market—the Iridium Go™ is the industry’s first portable satellite hotspot that connects to any smartphone or tablet, dramatically extending voice and data coverage for personal devices when they are out of range of cellular networks. 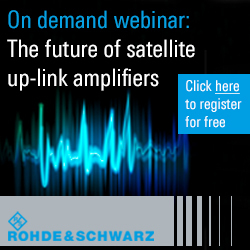 use some apps, even when terrestrial networks are non-existent, unreliable or costly. This first of its kind product allows users to conduct business, connect with family or access information no matter where they may travel—without the need for a satellite phone. Iridium GO with antenna ready for communication. Photo courtesy of Iridium Communinications. Iridium GO! is also a powerful platform for developers. Created to be flexible, Iridium is licensing the capability to allow app developers to use the Iridium® satellite network through Iridium GO! to tailor their products to meet the needs of organizations or individuals, and extend the capabilities of the product even further. Iridium GO! is incredibly simple to use, raising the antenna turns on the device, which then automatically connects to the Iridium network and establishes a Wi-Fi connection. By using a special Iridium GO! app on their device, individuals can then use their phone or tablet to make voice calls, text, send their precise location to family and friends and even report a personal emergency through an available SOS service. Several key features are built into the product. 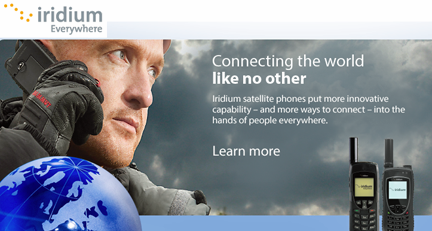 Like Iridium’s satellite phones, Iridium GO! is designed to be rugged; it is built to withstand rain, sand, dust and rough use. The included SOS functionality creates a fast, two-way connection with an emergency provider—bringing peace of mind anywhere in the world. With a small form-factor, Iridium GO! is highly portable, providing a Wi-Fi network with a coverage radius of 100 feet. Users can connect devices wirelessly without any special adapters and enjoy great voice quality, thanks to the use of optimized audio fidelity of their smartphones. In addition, Iridium GO! is Iridium NEXT-ready; it works on the current satellite network and will work with the new Iridium NEXT satellites that will launch in 2015. Also debuting is the company's first one-to-many global data broadcast service, Iridium Burstâ„ , enabling enterprises to send data to an unlimited number of devices anywhere on Earth whether inside buildings, in-vehicle or in aircraft. Iridium Burst leverages the high power channels of the Iridium® satellite network to offer a cost-efficient, customizable and low-latency broadcast data service that can provide service globally with high signal penetration capabilities superior to traditional paging and broadcast services. From tsunami warnings to weather and traffic alerts, over-the-air updates and other machine-to-machine (M2M) applications, Iridium Burst presents an unrivaled opportunity for businesses, government agencies, militaries, and other entities needing to broadcast data. As organizations worldwide seek ways to quickly and efficiently communicate with people and devices, Iridium Burst’s groundbreaking service offers transmissions that are four times more powerful than traditional satellite data services, reaching anyplace on the planet in less than 20 seconds. In addition to penetrating vehicles and buildings, transmissions can penetrate partial obstructions and even weather phenomenon. Iridium Burst is now available as a pay-per-use service compatible with the Iridium 9602GDB receiver, and in future devices from Iridium and Iridium partners. The third new offering from Iridium finds an expansion of the company's Iridium OpenPort® service to offer broadband communications to terrestrial users with the launch of Iridium Pilot® Land Station. For the first time, many remote individuals and businesses, working vehicles and off-the-grid locations can obtain reliable Internet connections and voice calling no matter where they are located. Whether deployed as a fixed installation or vehicle-mounted for communications on the move, Iridium Pilot Land Station is an easy-to-install communications platform that makes connections where no other choice exists. Iridium Pilot Land Station provides pole-to-pole coverage, broadband data speeds, with independent voice lines for simultaneous voice and data communications. The ruggedized hardware uses the proven Iridium OpenPort broadband service, allowing operation in extreme weather conditions, making it the obvious choice for users with critical communications requirements. Disaster recovery: Governments and emergency response organizations can quickly deploy Iridium Pilot Land Station to restore voice and Internet connections in stricken areas. 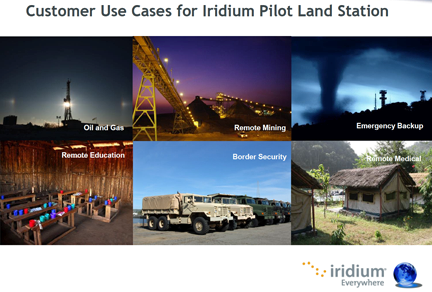 Remote education or humanitarian missions: For organizations providing education or humanitarian aid in countries without reliable telecommunications infrastructure, Iridium Pilot Land Station enables the communications they need to stay organized. Science and exploration: Explorers and scientists can work from anywhere on the planet, easily staying in contact with colleagues. This is especially important when exploring remote, treacherous areas where other satellite coverage falters. Business continuity: Whether due to an earthquake or a power outage, companies, governments and other organizations can rely on Iridium Pilot Land Station to provide a diverse connectivity solution independent of terrestrial infrastructure. The Iridium® global network provides reliable communications solution for locations beyond 75 degrees North and South, and is a proven technology backed by years of testing and use. The unique Iridium constellation of 66 cross-linked Low-Earth Orbit (LEO) satellites provides coverage over the entire globe and there is no need to establish line-of-sight. 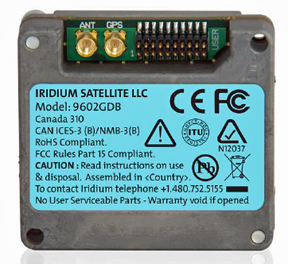 Available immediately, Iridium Pilot Land Station redefines the entry price point for satellite broadband communications. 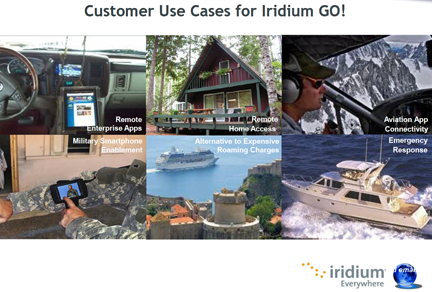 Iridium OpenPort provides a range of provisioning and pricing options for voice and data services depending on individual needs. For more information on how and where to purchase Iridium Pilot Land Station, visit the Iridium website at.